Yesterday Susannah took some photos of my performance with Danny Mc Carthy and Mick O'Shea, which I would like to share with you here. As mentioned previously, this improvisation was part of the Strange Attractor series, which is continuing for another week. 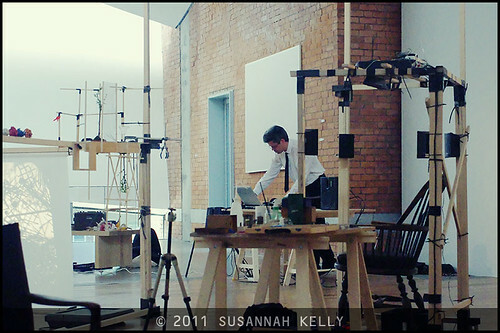 So if you are free for some lunch-time music (1-2pm), get down to the Crawford Art Gallery in the heart of Cork, Ireland. Each day there is a different guest artist. I found the space most conducive to a creative approach. The first floor gallery is beautifully open, non-rectilinear in shape and naturally lit. Not only that, it is quiet, so it is easy to hear not only the other performers but sounds from the audience and environs, all of which are important to me. The sculptural installations by Irene Murphy are endlessly fascinating, bringing to mind not only architectural plans and shapes but systems of classification, models of the natural world and attempts at codification and understanding. Her contribution to Strange Attractor 6 was vital. I love the first photo, above, where I am situated in relationship to some of these structures, almost as though I was embedded within them. 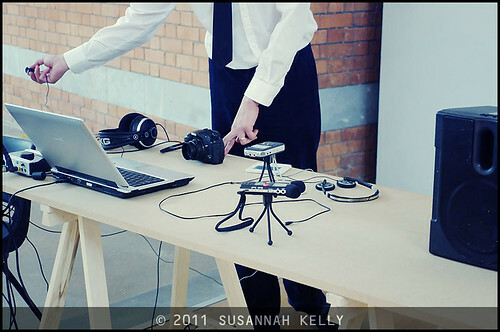 The two mini recorders and two sets of headphones were also available as possible instruments. Much of the sound came from use of an induction coil to pick up electromagnetic flux from the various gear. 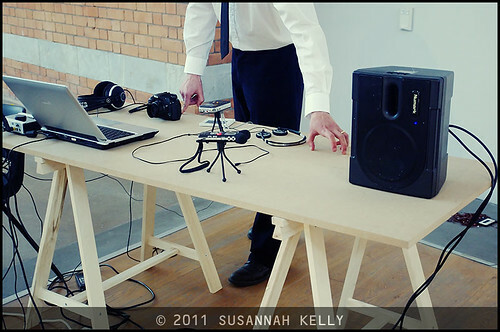 The table surface itself became a sounding board I could play in various ways, the sound picked up by a contact mic. At times I changed the orientation of the speaker which also changed the generated sound, since different frequencies could become part of a feedback loop with the contact mic. Here I am manipulating the instrument I have created in Reaktor, versions of which I have been evolving for over a year now. Besides an input compressor and output limiter I use various granular synthesis algorithms, but in fact try to stay close to the original sounds. More photos are available on Flickr. Simply click through any image for a larger version and to visit the rest of the set.